American civilian surveillance satellite. One launch, 2001.10.18. The QuickBird commercial imaging satellite was owned by DigitalGlobe (formerly EarthWatch) and used a Ball BCP2000 bus with a launch mass of 1028 kg and a dry mass of about 995 kg. 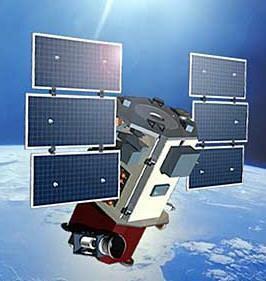 Earth observing satellite built by Ball Aerospace for Earthwatch Inc. => DigitalGlobe, USA. Launched 2000 - 2001. Used the BCP-2000 bus. Status: Operational 2001. First Launch: 2000-11-20. Last Launch: 2001-10-18. Number: 2 . Gross mass: 1,028 kg (2,266 lb). Unfuelled mass: 995 kg (2,193 lb). The satellite was reported to be capable of images with a resolution as small as 0.6 meter, though the standard products were to be coarser. Unlike the comparable quality images from IKONOS images, some of which are currently marketed exclusively to the US military, all Quickbird 2 images may be available in the open market. Family: Civilian surveillance satellite, Surveillance. Country: USA. Launch Vehicles: Delta, Delta 2 7000, Delta 7320-10. Launch Sites: Vandenberg, Vandenberg SLC2W. Agency: Ball. Bibliography: 2, 296, 6812, 12992.